The job outlook for Public Relations majors has never looked better. Thanks to the diversity of the skillsets required, there are a multitude of possible careers in public relations. International students studying in the United States have the opportunity to take on exciting jobs in public relations and make a real impact on their community. There are a number of different career paths available for international students interested in studying public relations. The most popular career choice is that of a public relations professional working for a PR firm or in the PR department of an organization or company. Many other graduates choose careers as media relations professionals and press secretaries who deal with different media outlets and journalists. As a public relations professional, expect to be the first line of defense as well as the face of the organization you are representing. Public relations specialists are expected to fix and mitigate any complications that might arise. Many PR majors go on to work for political campaigns as consultants to help with the public image of a political candidate. Graduates can also become strategic planners, working with a multitude of different companies and organizations to create advertising and public awareness campaigns to benefit the image of the organization. Other graduates turn to a career in journalism, where they may specialize in a certain subject. Other jobs in public relations include those of speech writers, advertising managers, lobbyists, publicity agents for celebrities, event coordinators, and account executives. After some years of experience in the industry, many professionals choose to use their expertise by going into consultancy. As consultants, public relations professionals are contracted out by a company to handle specific scenarios or problems with which they have extensive experience. The best way to gain valuable experience for a potential career in public relations is to participate in an internship program while enrolled in college. The best times for internships are generally in the latter half of your collegiate career. Many large PR firms offer internships to college students that allow them to experience real PR issues firsthand. International students studying public relations should also consider interning with non-profit organizations or public relations departments of companies. Not only are internships good for getting an understanding of public relations practices, but they also hold the opportunity to parlay into a job following graduation. Additionally, internships give students opportunities to network with professionals in the industry while allowing them to build relationships with other like-minded professionals. Many colleges offer college credit with internships in order to satisfy aspects of both academic and professional growth. Although gaining a degree from a top college program should be the first priority, international students pursuing careers in public relations should also focus on building a certain set of skills. The most important skills for public relations students to hone are in writing, public speaking, and critical thinking. PR professionals are expected to write professional memos, press releases and speeches. Verbal skills are paramount to obtaining a job in public relations, as PR professionals give speeches, press announcements, and take questions from members of the media. A professional demeanor and the ability to create and maintain relations is also a necessity. It is advisable for public relations students to take classes in different areas, including business, public speaking, English and writing, as well as in advertising or marketing. In addition, new trends in public relations have made the role of online social media increasingly relevant. Having personal hands-on experience in online media platforms like Facebook and Twitter is very appealing to future employers. International students up for the challenge will find public relations a very rewarding career. 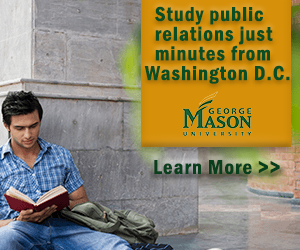 Learn more about studying public relations in the USA by reading our growing article collection. « Study Guide by Subject	« Study Public Relations in the U.S.
Over time we will be updating this section and including more information for those who want to study public relations in the USA and for other countries, but please feel free to post your thoughts and comments on our Facebook fan page, and also follow us and post questions through Twitter. Visit the Study in the USA School search to find schools that offer programs of study in Public Relations.